Monitoring the quality of water is essential if the quality is to be maintained or improved. Diffuse urban and rural pollution is a collective term for a range of pollutants that may individually not present a problem but when combined or present for a long duration, may cause deterioration of surface- and groundwaters and the associated ecology. Although the exact origin is often unknown, it can also include discrete discharges from, for example, septic tank discharges, road and urban run-off, small spillages, poaching by cattle or poorly maintained (farmyard) infrastructure. According to the Environment Agency, diffuse pollution, point source pollution and physical modification are the most common reasons for surface waters not to meet ‘good’ status under the Water Framework Directive (WFD). Diffuse pollution is also widely known to affect Bathing Water quality in coastal areas, particularly after periods of heavy rainfall. 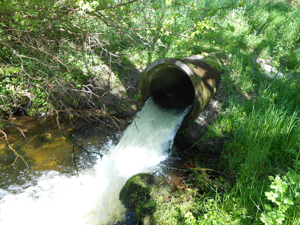 OHES provides innovative solutions for monitoring potential diffuse pollution sources using a range of novel tools such as continuous monitoring, composite and passive sampling equipment and modelling. This can be on a small scale, for example investigating the effect of an urban area on water quality of a section of a water course following heavy rainfall as well as on a catchment level. An example of our recent work on diffuse agricultural pollution is RSPB Leighton Moss, Scotland, which was deemed to be failing WFD standard for nutrients such as phosphorus and nitrogen. OHES employed a ‘hindcasting’ nutrient study at a catchment level to establish whether the current WFD targets for nitrogen and phosphorus were realistic and if they could have been met before intensive agriculture was adopted in the catchment since the 1940s. 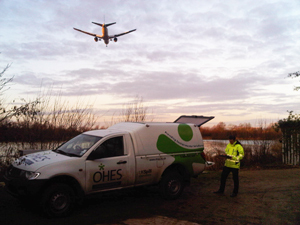 OHES is responsible for providing a range of integrated monitoring services including surface and foul water sampling and analysis, fishery surveys, aquatic macro-invertebrate surveys and environmental incident response at some of the largest International Airports in the UK and across several large airport groups. 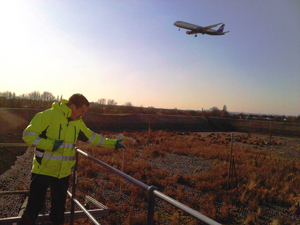 Our work includes design of monitoring programmes along relevant legislation, regular collection of effluent, surface water, ecological and foul water samples both airside and landside. Employing a truly integrated approach, we undertake fisheries, algal and macro-invertebrate surveys in order to link the water quality observed to ecological communities present in receiving water bodies. We consolidate all monitoring information into tailor-made detailed and overview results sheets and annual reports, integrating the different monitoring disciplines. Additionally, we provide 24-7 response cover for any technical queries, conduct pollution prevention site walkovers, highlight and conduct investigations and provide technical advice on effluent treatment. OHES has also been involved in specific research projects investigating the effects of the use of de-icers and other products on local water quality, at ways in which de-icer agents can be recovered and re-used and providing options for the improvement of effluent quality by enhancing biological breakdown within balancing lagoons and reedbeds. 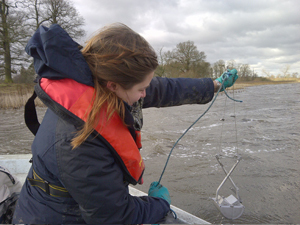 OHES has conducted an intensive nutrient and plankton study of the River Thames through London, visiting up to 20 sites over the duration of a year. The study focused on the effects of nutrient availability and how this contributed to primary and secondary production and taxon diversity in the river system, supporting the decision making process regarding large abstractions and discharges in the area. 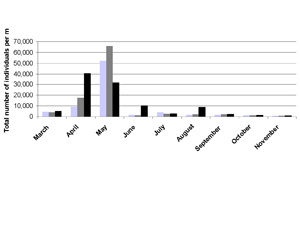 Our study revealed significant seasonal changes within the space of a year and provided a very useful insight into the relationship between the river ecology, nutrient availability and highlighted how limitation of certain nutrients affected the abundance and diversity of phyto- and zooplankton communities in a large system.